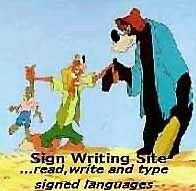 Our editors have selected the SignWritingSite as one of the best on the Internet when reviewed for quality, accuracy of content, presentation and usability. With this award, we wish to tell visitors that Britannica editors have rated your web site one of the most valuable and reliable on the Internet, in the company of an elite group of Web sites. We know quality is always difficult to accomplish and maintain. Congratulations on being a selected member of the Britannica Internet Guide. We look forward to our growing association in the future. The SignWritingSite has been selected as one of the Net's finest informative web sites. StudyWeb is one of the internet's premier sites for educational resources for students and teachers. Since 1996, our expert reviewers have scoured the internet to select only the finest sites. The SignWritingSite has been selected as one of the best educational resources on the Web, by our researchers. you for a Sunset Award. 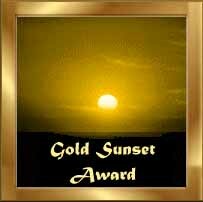 We have viewed your web site and are pleased to award you with the Sunset Gold Award for graphics and web design." Clear images of those who helped me as a boy, our family as adults, and other children and adults as told in books and relayed in oral tradition, speak of deeds done yester year. Living among us is a true legend, Valerie Sutton, who chose to lead, while others will follow; chose to develop, while others will emulate. Learning a new language is often difficult. To learn Sign Writing is rewarding, an act of compassion, empowerment and conceding self interest. "We have established the Talking Hands Award to honor those who teach our children, and adults as well, through their web site creations. The SignWritingSite was nominated by 7 people. These nominations were made from their "hearts". "Our Editors have selected your work because it's a rare and great thing when web authors create quality content appropriate for kids. Congratulations! featured the SignWriting Web Site. The Deafness/Hard of Hearing section on the Mining Company Web Site, created an entire directory on their web site devoted to SignWriting.